Summer is winding down, kids are going back to school, and training camps and preseason games herald the start of the football season – and with that, game day entertaining. 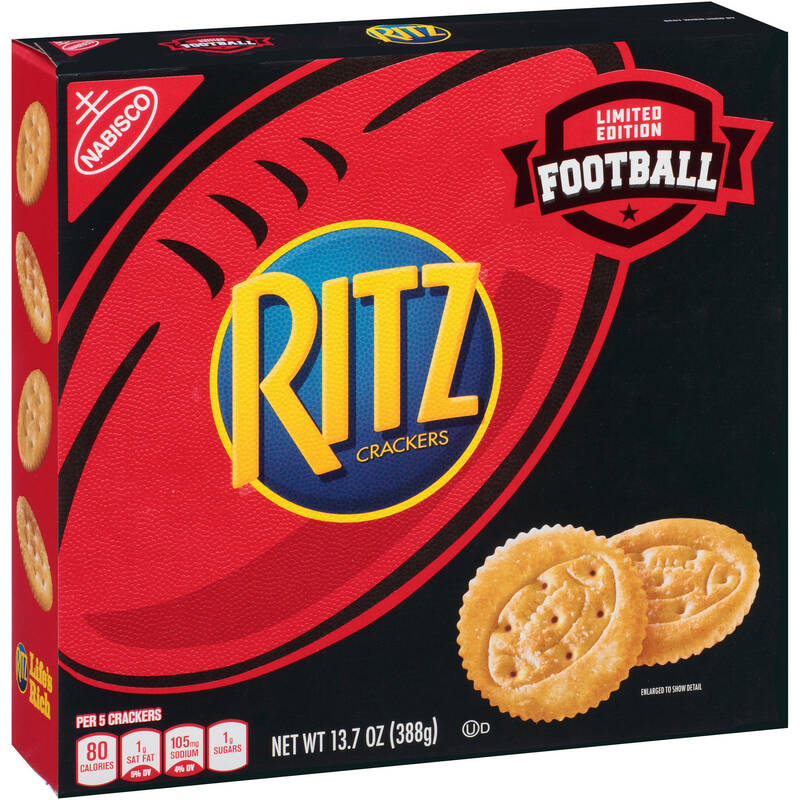 Football has become its own season equivalent to almost any holiday season, and Nabisco Ritz Crackers is capitalizing on it with the release of their 2016 limited edition football packaging. In what to me has become an overwhelmingly yellow snack cracker category, Ritz’s bright red package grounded by its iconic blue logo has consistently stood out. 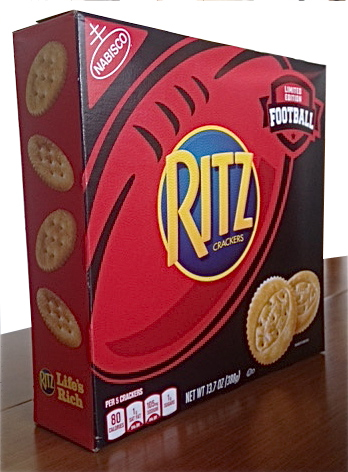 Moving away from the standard red package format, the football package is solid black yet still relies on the targeted blue Ritz brand shield, which is situated on the side of a bold red football graphic. What I think is genius about this particular package is that without changing the package size, the brand has applied a bold, straightforward design that has the strength and confidence associated with hard-core football imagery. Yet it is design neutral, not relying on team specific identities or icons to communicate with the consumer. This makes the package appropriate for entertaining with grade school, high school, college or league football events. The highly stylized super graphic of a football on the face panel of the package acts as a symbolic image, but on closer look has also added a subtle textural background replicating the leather surface of a football. The texture becomes more evident in the Ritz logo, which being centered in the side panel of the football makes this the official Ritz League ball. Ritz owns this 100%. To carry the concept of the package to conclusion, the crackers ha ve been modified to reflect an imprinted shape of a football. A supporting emblem designating this as a limited edition package provides a portable communication element that can be separated from the football super graphic used as a stand-alone design element on smaller panels of the package. 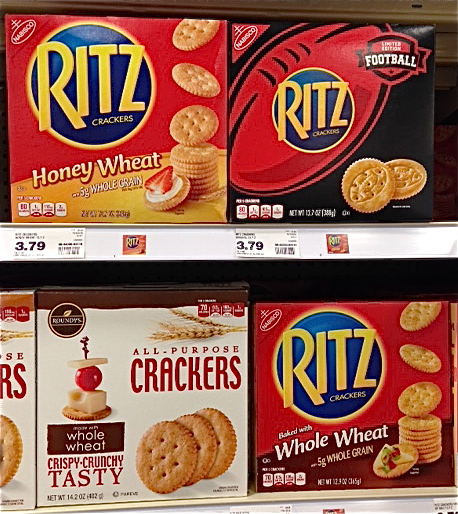 The bold change in package design still fits in with the larger Ritz packaging scheme, but wherever it is on shelf, succeeds in distinguishing itself from the larger Ritz product line and other competitive products with its uncluttered approach. Using an effective balance of design, color and negative space, the face panel requires virtually no copy to communicate with consumers. Like other Nabisco limited edition packaging, the side panel of the package is stripped free of copy and is only crackers. But even the best designs can hide a mistake – the crackers on the side panel of the package should be the same crackers that appear on the face panel of the package. Oops! This is just a fun package, pure and simple – the design and execution are well done and do the job of grabbing attention and creating impact in an overcrowded segment. If I were going to recommend changing anything, I would give consideration to utilizing some form of branding on the back panel of the package to complete the association of the perfect party companion.